For the baseball player, see Josh Hart (baseball). Josh Hart (born March 6, 1995) is an American professional basketball player for the Los Angeles Lakers of the National Basketball Association (NBA). He was selected with the 30th overall pick by the Utah Jazz in the 2017 NBA draft before getting traded to the Los Angeles Lakers on draft night. Hart played college basketball for Villanova. As a sophomore, Hart was named the Big East Tournament most outstanding player. He was named a third-team All-American as a junior, when he helped lead the Wildcats to a national championship in 2016. As a senior in 2017, he was a consensus first-team All-American. Hart was born on March 6, 1995 in Silver Spring, Maryland to Moses and Pat Hart. He has two siblings, Moses Joseph Hart and Aimee Hart. He is also the great-nephew of the baseball catcher Elston Howard. Growing up, Hart gravitated toward basketball and earned a reputation as a high-energy player. He attended Sidwell Friends School, where as a junior he averaged 20.6 points and 11.6 rebounds per game. However, he was nearly kicked out of school due to poor grades until several students and parents petitioned the school to give him a second chance. As a senior, Hart averaged 24.3 points, 13.4 rebounds and 2.8 steals per game in leading the team to a 22-9 record. He was a first team All-Met selection by the Washington Post and Rivals.com's 82nd ranked prospect in the class of 2013. After considering Rutgers and Penn State, Hart signed a letter of intent with Villanova in November 2012. "It's about doing the things that the coaches want me to do," he said after committing. "I might not hit the winning three but I'm going to be the one that goes and gets a rebound when we need it and goes on the floor for a loose ball, anything to win." He got to know future Villanova teammate Kris Jenkins while playing AAU basketball in the Washington area. Hart was awarded Boy Scouts of America's highest rank, Eagle Scout, and became one of only three known Eagle Scouts who have played in the NCAA's Final Four (along with Princeton's Bill Bradley and Stanford's Mark Madsen) He is the only Eagle Scout to ever start on an NCAA Men's Basketball Championship team. A 2013-14 Big East All-Rookie Team selection, Hart averaged 7.8 points and 4.0 rebounds per contest as a freshman at Villanova. He was named Big East Rookie of the Week three times. He did not shoot the ball particularly well, making 31 percent of his three-point tries, but possessed "amazing confidence," according to assistant coach Baker Dunleavy. In the second game of his collegiate career, a 90–59 win over Mount St. Mary's, Hart posted a double-double of 17 points and 11 rebounds. He scored a season-high 19 points in an 88–67 win over Rider on December 21, 2013. Hart had 18 points and eight rebounds in a loss to Seton Hall in the Big East tournament quarterfinals. Hart and teammate Darrun Hilliard both scored 20 points in an 85-62 rout of Temple on December 14, 2014. Hart scored 21 points in a December 20 game against Syracuse. The Wildcats never led in regulation and were down by 14 points in the second half, but managed to pull out an 82-77 overtime win. On February 28, 2015, in the second half of a game against Xavier, Hart was hit in the mouth during a scramble for the ball, requiring stitches on his lip. As a sophomore, Hart was named the Big East's sixth man of the year at the conclusion of the regular season. "He's the perfect sixth man because he can come in and play any position except probably point guard," head coach Jay Wright said. Hart was the most outstanding player of the 2015 Big East Men's Basketball Tournament, the first bench player to receive the honor. He was the tournament's leading scorer at 17.7 points per game, including a 20-point performance in an 84-49 quarterfinals victory over Marquette. He improved his three-point shooting to 47.3 percent, forcing opposing teams to guard him more on the perimeter. He improved his season averages to 10.1 points and 4.5 rebounds per game. Hart's 2015–16 Wildcats were the unanimous coaches preseason selection to win the conference. In the NIT season tip-off, Hart scored a career-high 27 points to help Villanova defeat Akron by a score of 75-56. On January 2, 2016, Hart scored 25 points in a win over Creighton. Hart led the Wildcats to reach number one in the AP Poll by climbing to the top of the 2015–16 NCAA Division I men's basketball rankings on February 8. He was named to the 35-man midseason watchlist for the Naismith Trophy on February 11. At the conclusion of the regular season, Hart was unanimously selected first-team All-Big East. Hart was named a third-team All-American by the National Association of Basketball Coaches He then helped Villanova win its second national championship in school history, and first since 1985. On the season, he averaged 15.5 points, 6.8 rebounds, and 1.8 assists per game. Hart briefly thought about the 2016 NBA Draft, but pulled his name out before the deadline. Coming into his senior season, Hart's Wildcats were projected to win the Big East by the coaches and he was named Preseason Player of the Year. He was named to the Associated Press preseason All-America team on November 2, 2016. In November Hart scored a then-career high 30 points vs Wake Forest in a 96–77 win at the Charleston Classic. On December 10, Hart scored a career-high 37 points along with 11 rebounds and four assists in a 74–66 win over Notre Dame to push No. 1 Villanova to a 10–0 record. On March 11, 2017, in the regular season finale versus Creighton Bluejays Hart scored 29 points in a 74–60 win. Unlike the previous season, Hart's Villanova career would end in the 2nd round disappointment, when Bronson Koenig outgunned Hart and the other Wildcats while leading the Wisconsin Badgers to a 55-53 victory. On June 22, 2017, Hart was drafted 30th overall in the 2017 NBA draft by the Utah Jazz. He was subsequently traded to the Los Angeles Lakers along with the 42nd overall pick, Thomas Bryant in exchange for the Lakers 28th overall pick, Tony Bradley. On July 3, 2017, Hart signed his rookie scale contract with the Lakers. In his first start on December 14, 2017, Hart recorded a double-double against the Cleveland Cavaliers, scoring 11 points and grabbing 10 rebounds. Hart fractured his left hand in practice on February 28 and was sidelined until the end of March. In his final game as a rookie, Hart scored a career-high 30 points against the Los Angeles Clippers, shooting 7 of 9 from three. Hart finished the season averaging 7.9 points per game and 4.2 rebounds per game, recording 8 double-doubles. Hart shot 39.6% from three, leading the team in three-point percentage. Hart was named the league MVP of the 2018 NBA Summer League after averaging 24.2 points and 5.2 rebounds per game and setting a new Summer League game-high of 37 points for the Lakers' players. On July 27, 2018, he switched his jersey to No. 3 after playing with No. 5 in his rookie season. On March 28, 2019, the Los Angeles Lakers announced that Hart had underwent a successful ultrasonic debridement procedure on his right knee patellar tendon and was expected to miss the remainder of 2018–19 season. ^ a b c d e "Josh Hart Biography". Villanova Wildcats. Villanova University. Retrieved October 4, 2015. ^ Juliano, Joe (January 28, 2015). "Villanova's Hart says he'll never stop hustling". The Philadelphia Inquirer. Retrieved October 8, 2015. ^ Donnellon, Sam (March 13, 2015). "Hart puts his soul into Villanova's win over Marquette". Philadelphia Daily News. Retrieved October 8, 2015. ^ Juliano, Joe (October 17, 2013). "Villanova gets commitment from Washington, D.C. swing man". The Philadelphia Inquirer. Retrieved October 8, 2015. ^ a b Juliano, Joe (March 21, 2014). "'Nova freshmen Hart and Jenkins make their mark". The Philadelphia Inquirer. Retrieved October 8, 2015. ^ a b c Sielski, Mike (March 23, 2015). "'Nova's Josh Hart has earned respect with his shooting". The Philadelphia Inquirer. Retrieved October 8, 2015. ^ "Villanova shoots downs Mount St. Mary's 90-59". ESPN. Associated Press. November 13, 2013. Retrieved October 9, 2015. ^ "Josh Hart scores 19 points as No. 8 Villanova tops Rider". ESPN. Associated Press. December 21, 2013. Retrieved October 9, 2015. ^ "No. 7 Villanova stays undefeated, routs Temple". ESPN. Associated Press. December 14, 2014. Retrieved October 9, 2015. ^ Rubin, Roger (December 20, 2014). "Villanova storms back in OT win over Syracuse, 82-77". New York Daily News. Retrieved October 9, 2015. ^ Frank, Reuben (March 15, 2015). 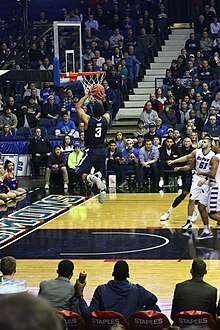 "Big East preview: 6th man Josh Hart Villanova's unsung hero". CSNPhilly. Retrieved October 8, 2015. ^ Frank, Reuben (March 15, 2015). 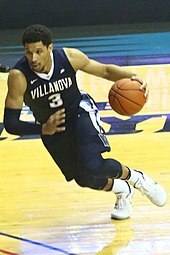 "Villanova's Josh Hart an unlikely Big East tournament MVP". CSNPhilly. Archived from the original on May 22, 2015. Retrieved October 9, 2015. ^ "No. 4 Villanova routs Marquette 84-49 in Big East quarters". ESPN. Associated Press. March 12, 2015. Retrieved October 9, 2015. ^ Hille, Bob (October 14, 2015). "Coaches unanimously pick Villanova to win Big East again". Sporting News. Retrieved October 20, 2015. ^ "Hart's 27 points lead No. 11 Villanova over Akron 75-56". ESPN. Associated Press. November 22, 2015. Retrieved December 31, 2015. ^ "Hart, Ochefu lead No. 16 'Nova to 85-71 win over Creighton". ESPN. Associated Press. January 2, 2016. Retrieved January 6, 2016. ^ Beaton, Andrew (February 8, 2016). "Villanova Ranked No. 1 for First Time in AP Poll". The Wall Street Journal. Retrieved February 9, 2016. ^ "Four Named Unanimously to MBB All-BIG EAST First Team". Big East Conference. March 6, 2015. Retrieved March 9, 2015. ^ Martin, Derek (March 28, 2016). "ISU's Niang named second-team All-America by NABC". ^ Norlander, Matt (May 26, 2016). "Villanova's leading scorer, Josh Hart, pulls out of NBA Draft and will return to school". CBS Sports. Retrieved October 12, 2016. ^ Norlander, Matt (October 11, 2016). "Coaches Pick Villanova to win Big East, Josh Hart as Player of the Year". CBS Sports. Retrieved October 12, 2016. ^ "Duke's Allen leads AP preseason All-America team". Foxsports.com. November 2, 2016. Retrieved November 12, 2016. ^ "Hart scores 30, leads No. 3 Villanova over Wake Forest 96-77". ESPN. Associated Press. November 18, 2016. Retrieved July 18, 2018. ^ "No. 1 Villanova beats No. 23 Notre Dame 74-66". ESPN. Associated Press. December 10, 2016. Retrieved July 18, 2018. ^ "Defending champion Villanova in line for No. 1 overall seed after Big East tournament title". ESPN. Associated Press. March 11, 2017. Retrieved July 18, 2018. ^ "Lakers Acquire Josh Hart, Thomas Bryant in Trade with Utah". NBA.com. June 22, 2017. Retrieved July 4, 2017. ^ "Lakers' Josh Hart: Starting at shooting guard Wednesday". CBS Sports. December 21, 2017. Retrieved July 18, 2018. ^ Youngmisuk, Ong (July 17, 2018). "Lakers' Josh Hart, who set out to dominate, named summer league MVP". ESPN. Retrieved July 18, 2018. ^ Moreno, Matthew (July 27, 2018). "Lakers Offseason: Josh Hart Changes To Jersey No. 3". Lakers Nation. Retrieved July 28, 2018. ^ "Josh Hart Medical Update". NBA.com. March 28, 2019. Retrieved March 28, 2019. Wikimedia Commons has media related to Josh Hart. This page was last edited on 19 April 2019, at 09:30 (UTC).